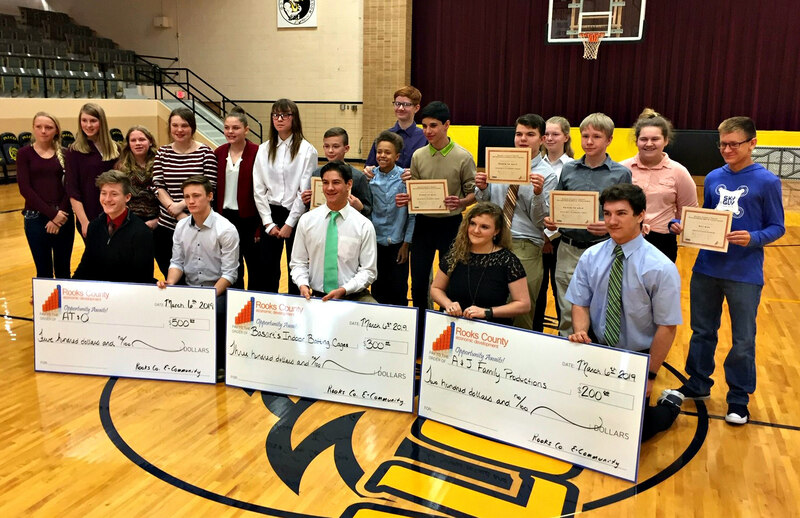 Rooks County E-Community and Economic Development, in association with the Network Kansas E-Community Partnership, hosted the third annual Rooks County Youth Entrepreneurship Challenge on Wednesday, March 6 at Palco High School. Twenty one individuals, representing 10 teams from Plainville, Stockton and Palco schools, presented their business concepts with a written business plan, a 4 minute presentation to judges, and a tabletop marketing display. This year’s winning concept was presented by Quinn Coffey and Trenton Howell of Stockton High School. Their concept, called AT&Q, was presented as a technology software/hardware repair business. They complete repairs of cell phone screens, computers, and other technology devices. Second place went to Basart’s Indoor Batting Cages and Supplies, which was presented by Rylan Basart of Stockton High School. Rylan demonstrated through the use of 3D images, his idea of batting cages and supply storage units. Jalen Basart and Addie Struckhoff were awarded third place for A&J Family Productions, which would use products such as old barn wood to create and repair farmhouse and rustic décor. The Marketing Award, sponsored by Nex-Tech, was presented to Carter Cellmer of Plainville for Sunflower Signs. Carter’s partner in creating the display and plan, Corbyn Marquess was unable to attend. Other awards included: Growing Kansas Ag Award to Skyler Keller from Palco and his drone business called Sky-Guy (sponsored by JSK Trucking of Woodston); Best Use of Technology to AT&Q; and Giving Back to Community was awarded to Michael Garvert, Josiah Slothower, and Cory Cimaglia of Plainville for their business called Hands to Help. Cash prizes of nearly $1,500 were awarded to the winning teams as part of sponsorships by Rooks County Economic Development, Rooks County E-Community, Nex-Tech, and JSK Trucking. In addition to prizes and recognition, the first-place finisher is automatically qualified for state YEC competition on April 30 in Manhattan. All other teams can apply for 15 wild card positions at that same event. The state YEC event will include the top young entrepreneurs from schools across the state of Kansas.